Steve Allen wants to be the man to lead a Ferring Football Club revival next season. A torrid Southern Combination League Division 2 campaign came to an end on Saturday with a 7-0 home defeat at the hands of Roffey. From the 28 league games played over the course of the season, Ferring failed to collect a single point, conceding 300 times, while netting just 14 goals. Despite such a difficult campaign, Allen felt positive signs were on show in their final few games. The Ferring boss, who took over in September, wants to lead Ferring once again next season whatever division they find themselves in. 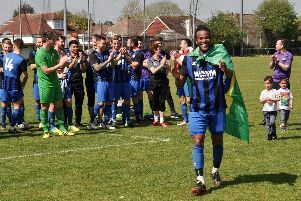 He said: “I’m going to have a chat with Deane Culver (Ferring chairman) at some stage but I want to remain at the club. “It’s been such a challenge this season and I want to rebuild and lead a much more positive season next year. “I’ve got plans in place, with a shake-up planned should Deane decide I’m the right man to stay in charge. Adam Wicking hit a hat-trick for Roffey on Saturday, while Benjamin Brooker, Gavin Fowler, Jack Munday and David Fowler also netted to send Ferring to a 7-0 defeat in their final game of the season. Conditions were quite foggy at The Glebelands for the clash but Allen admitted everyone associated with the club just wanted the season to be over. He added: “It was a little foggy but we just wanted to get the game on.